Canada is full of young, skilled and knowledgeable people who are driving the greenhouse industry forward. From commercial growers and wholesalers to manufacturers, equipment suppliers and service providers, they are the best and brightest in our industry. Join us as we celebrate the future of horticulture in Canada. Anyone in the horticulture or associated industries who is under the age of 40 as of December 31, 2014. Equipment and technology suppliers welcome. NOMINATIONS CLOSE AUGUST 29TH 2014. 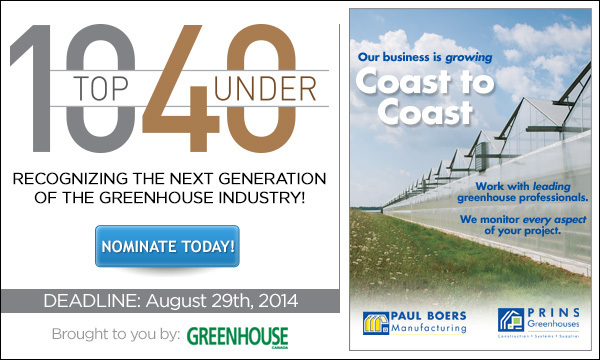 The Top 10 Under 40 winners will be featured in the November 2014 issue of Greenhouse Canada.